Congratulations to Jester Pelaez and the team at Maarefah Management, who have been selected as the next SimpleCert Certificate of the Month Winner! Located in Dubai UAE, Maarefah Management is a world-class events, training and association management company that works closely with government institutions, industry bodies and professional associations. Maarefah Management works with these professional associations to help enhance their members’ development, networking, and overall professional growth. Jester and the team at Maarefah Management produce dozens of high profile events each year for clients throughout the Persian Gulf region. As their business evolved, they turned to SimpleCert to distribute Certificates of Attendance. After manually creating Certificates, an online search led Maarefah Management to SimpleCert in December of 2016. The team at Maarefah Management now utilizes SimpleCert as their Certificate Management system for all of their Certification needs. “SimpleCert has provided our team with an easy solution to create, modify and send out Certificates to all our delegates and speakers. As our company is in the events industry, it is important for us to have a useful and convenient application to use,” says Jester. 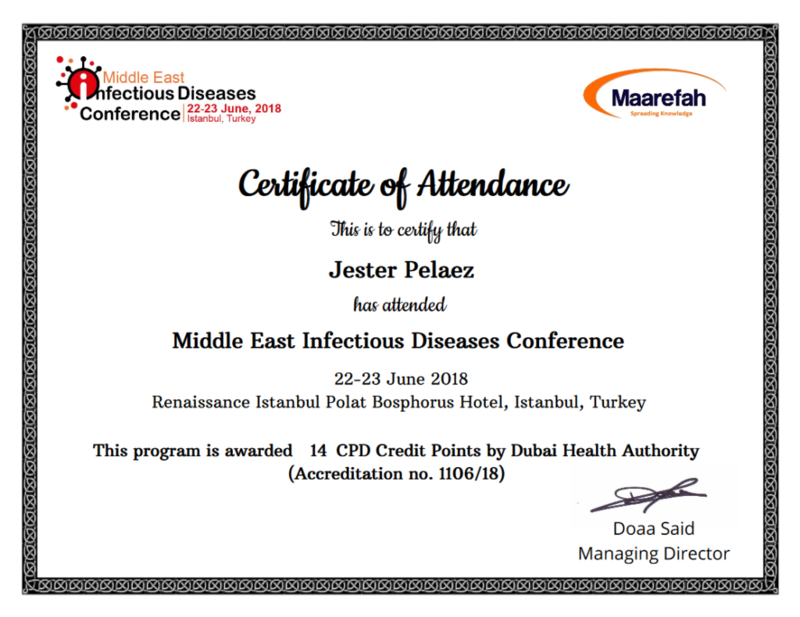 Given the number of conferences and events that Jester and the Maarefah team produce, convenience and efficiency were clearly key when searching for a better way to manage certifications. Jester utilizes multiple Certificate Template designs for specific conferences and events. In addition, he utilizes the notification email to deliver a personalized message to each certificate recipient. Also, by utilizing the “Pay As You Go” subscription method within SimpleCert, Maarefah Management is able to purchase credits as needed to create certificates – without risk of over spending, or losing unused credits. Congratulations again to Jester and the team at Maarefah Management for being selected as a Certificate of the Month winner! As a winner of the program, Jester has received 250 free credits to Maarefah’s SimpleCert Account. Would you like to nominate a certificate to be included into the Certificate of the Month Program? Simply send an email to inquiries@simplecert.net, and check back in the future as more winners of the program are announced.